The Intercontinental Gardener: Fully charged... soon? Some unspecified Pulmonarias are in full bloom in my garden. Their flowers flicker, shimmer, beam into my winter-weary eyes, charging my depleted batteries with their electric blue current. Sustainable energy, I assume. They appear to be such delicate plants, yet they thrive my difficult soil. James - these also grow on a really poor, gravely soil, and look fabulous. I haven't grown Pulmonarias before, but will definately give them a go again when back in Sweden. Sophia - visst är de väldigt elektriska i färgen. Jag försökte hitta namnet till dem, men utan lycka. Ha en skön helg, du med! 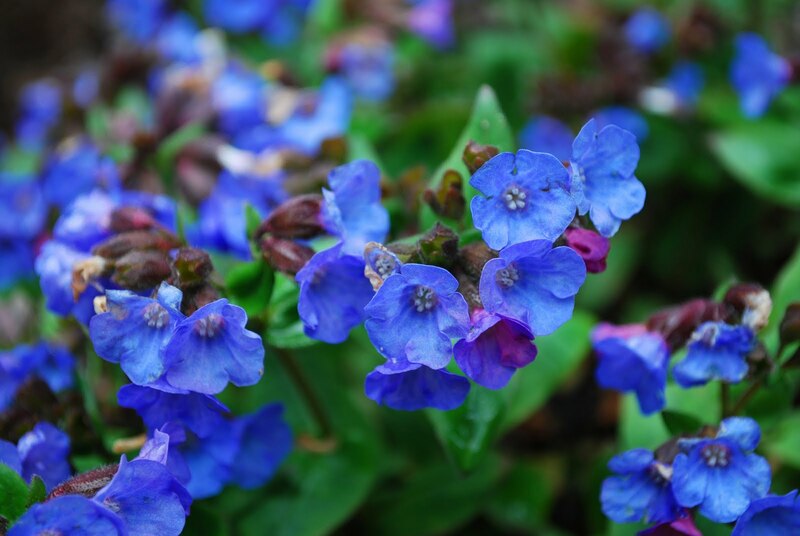 I thought my Pulmonaria 'Blue Ensign' is the 'bluest' pulmonaria I can find, but yours is a 'true blue'. Inga utsläpp här, inte! Ha en trevlig helg, Hillevissan, du med! L.